This year the total prize pool is $252 million! There are heaps of prizes available including cars, home entertainment systems, Free Fuel for a Year, Shopping Vouchers and much more! For a full list of prizes, click here. There’s two ways you can win – through the Instant Wins – where 1 in 5 tickets win instantly or through the Collect to Win properties. You can instant win Food Prizes like Big Macs or Sundaes, or Non-Food Prizes like Suzuki Scooters, Free Days Out, Free Hobby Sessions, Free Movie Tickets and more! 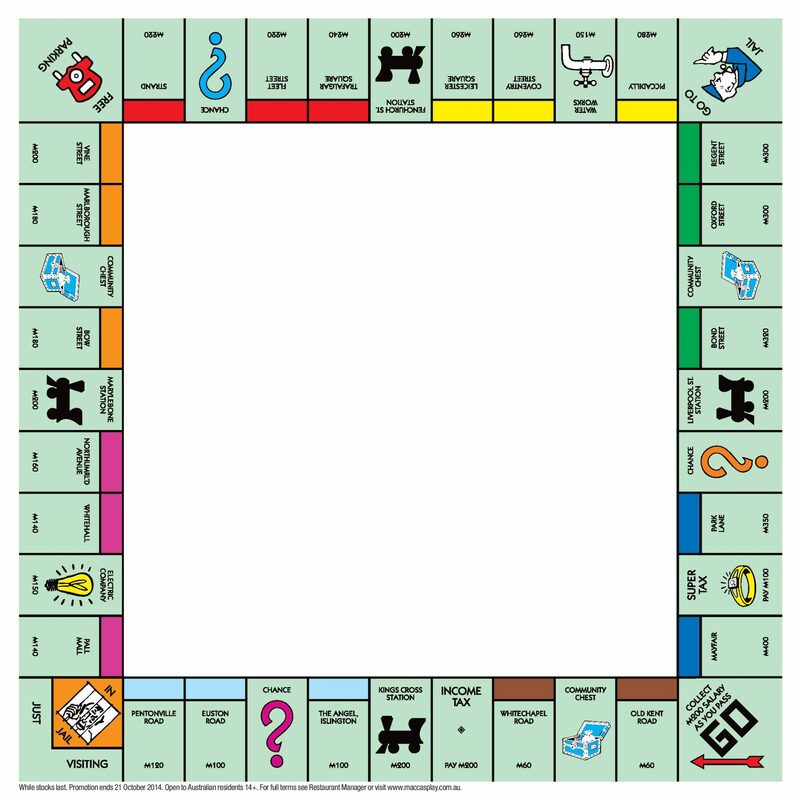 There’s also Collect to Win properties – where if you collect the full set of Monopoly properties from one colour, you can win major prizes like a car, BBQ, home theatre systems and $1,000 shopping vouchers. To find out which tickets you need to win and the prizes, click here. If you’re looking for more detailed prize information for a specific prize, click on one of the links above. This year, the app is back and better than ever and there’s a brand new feature! Brand new this year is The Chest. With the app, every five property tickets that you scan gets you another Chance ticket – giving you another 1 in 5 opportunity to get a instant win! As with previous years, you can scan your regular Chance tickets through the app to find out what property or prize you have won. In addition, every ticket that you scan through gets you a crack at the Second Chance Draw, which means you could be drawn to win unclaimed prizes worth over $250 after the promotion ends. For more information and to read more about the Monopoly at Macca’s app – click here. To download the app, click this link to download the iOS app, and click this link for the Android app. To collect game tickets, you’ll need to purchase the McDonald’s products in the below. You’ll still get tickets if you purchase a value meal – for example, a Medium meal will earn you 2 tickets while a large will earn you 4 tickets. If you purchase a value meal with one of the burgers or salads below, you’ll earn extra tickets! You can also get an extra ticket when you order through the mymacca’s app. The code will be emailed to you a few days after your order. You’ll need to sign up and go to the Macca’s Play website to enter in the codes to claim the prizes. The promotion starts on September 5. You’ll be able to purchase items and collect tickets up until October 16, and you’ll be able to claim prizes up until October 31! Let us know in the comments what tickets you’ve recieved! For more McDonald’s news and deals, click here. Or for more food news, deals and reviews, go to our home page or like us on Facebook! Have any thoughts about Macca’s Monopoly or need certain pieces to complete your set? Leave a comment below! If you click on the hamburger at the top left of the app, you get a few interesting items (well interesting is a relative term I suppose). There is a list of how many of each prize has been claimed – including over 1.2 million small fries! Also, the fine print spread across several documents might help put you to sleep at night, but if you had ANY questions at all about the details, the answers are sure to be there. Thanks for the rare list – looks like a free Big Mac was the best we managed this time! I have a Package (Pall Mall) ha ha love it but I need home Whitechapel Road. If you need spare tickets either for Food or 2nd Chance Tickets, plus there is the in App 2nd chance by tapping the red chest every 5 tickets, and have a local Maccas near a Park, do what I do on Saturday/Sunday Mornings. Clean up the park of the overnight rubbish. I do this normally anyway regardless of this promotion as the council does not clean up on weekends. You should average ~15 tickets per day plus clean up the environment at the same time. Take dish washing gloves, bucket/bag and a pen to remove the tickets. I have a flight centre$5000 gift voucher kind of don’t believe it. I seriously think no one really wins. I have so many of same tickets I am going to obese and still win zero. I just win food! I notice prizes in other states. Why is ACT no wins? Never win anything one off from winning something cool. So is it one rare ticket then? Which states have them? It seems like the link for “Movies for a year” on the prizes as leads to the “movie ticket” offer and thus the former dosent have a page. Can you fix this? How many of each “rare” are made? In the distant past it used to be more rares than the number of prizes (2x-4x) and it was first to claim gets them. This resulted in disgruntled customers sueing maccas. Now it’s exactly one rare for each prize. Any that are unclaimed by the end of the promotion period goes into the second chance draw, every single ticket you put into the app gives you one entry in this final prize draw.